⁦The Labour Party teams up with the Muslim Brotherhood to condemn the #FreeTommy movement. Could they do anything more to prove their hatred for Britain!? 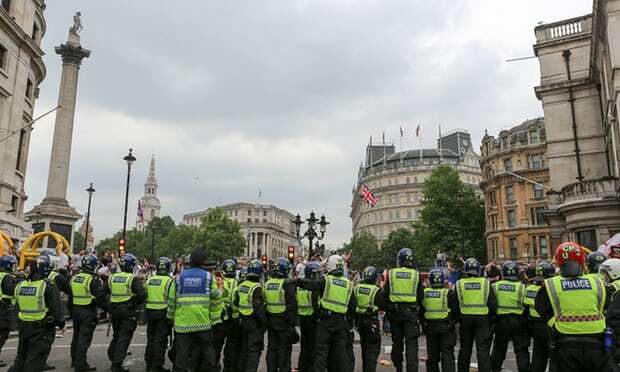 Police line up against protesters in Trafalgar Square, marching to demand Tommy Robinson be freed from prison, 9 June 2018. The 15,000-strong violent far-right protest to “free Tommy Robinson” on Saturday 9 June has raised major questions for all those who value our diversity. The racist right are using Robinson to reorganise. Nazi salutes and Islamophobia were at the centre of the mobilisation. This is the first serious attempt since the collapse of the English Defence League (EDL) to develop a racist street movement and give it a political form. It is supported internationally by notorious figures including from the US and the Dutch Islamophobic right. It is absolutely vital that all who oppose this come together in a united mass movement powerful enough to drive these new developments on the far right back. Donald Donald Trump has played a major role in galvanising the racist right. We will take to the streets for the Together Against Trump demonstration coinciding with his visit on 13 July. And when Robinson’s supporters take to the streets again on 14 July, we will protest against them too. Wherever the far right’s support grows so does racism and violence. Let’s come together to defend our multicultural society from those who spread hatred and division. Multiculturalism can be only between compatible cultures… not with those cultures and ideologies aiming at anihilated the Western Civilisation and it’s peoples. If the “Leftists” do not understand this is because their treason has become irreversible and require themselves to be classified as enemies. who HAVE to be Removed from office and Permanently “incarcerated“ for their crimes – ASAP !!! (socialists islamophiles who are instrumental in the invasion and diversification of the UK … admitted Treason/Sedition/Subversion) !!! They who MUST have their Freedom revoked and be Permanently “incarcerated“ !! !